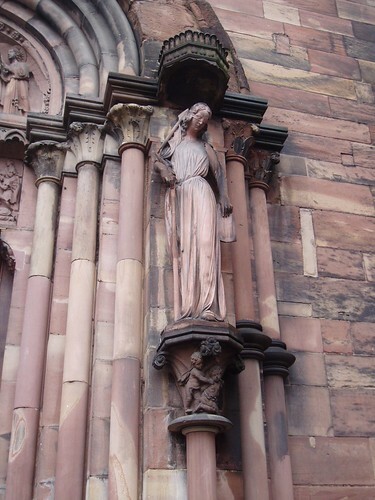 Female figure representing the Synagogue (old law) situated beside the twin portals of the south transept facade at Strasbourg Cathedral. The sculpture is a 20th century copy of the original figure, which is now displayed in the nearby Musee de l'Oeuvre Notre Dame. The Cathedrale de Notre Dame in Strasbourg is one of France's most impressive gothic buildings, and is particularly noted for it's soaring west facade, richly ornamented and crowned by a single steeple (two were originally planned but this hardly seems to matter, the design was much modified by a succession of architects). The facade and spire dominate the old heart of Strasbourg like a medieval cliff-face, more reminiscent of German gothic, particularly the cathedral of Cologne than most of it's northern French brethren. The German feel is reinforced by the warm red sandstone used throughout the building. Approaching the cathedral is an unforgettable experience as it's huge ornate mass rises above and beyond the stree, the drama heightened by the fact there is so little space immediately in front of the church to take it all in. Much of the original sculpture of the main portals has survived, on the towering spiky portals of the main facade as well as those of the transepts. Some of the finer and more exposed figures have been removed to the nearby Musee de l'Oeuvre Notre Dame for protection and replaced by perfect copies on the building itself. Inside the nave owes more to French Gothic in it's forms, but the Germanic influence is still felt in the older, Romanesque apse and transepts (unusually the eastern limb barely projects beyond the crossing) and in the later side chapels and the stained glass, most of which is medieval (including a sequence of German rulers in the north aisle, legacies of a fluctuating border). There are fine medieval artworks in glass and stone all around the cathedral, a particularly fine example being the beautiful 13th century sculpted Angel Pillar in the south transept. My visit here was not helped by rather dull, rainy weather, which darkened the warm tones of the stonework and rendered the interior somewhat gloomy (much would have been barely visible without electric lighting). It was nevertheless a magnificent sight to behold.